This microwave potato recipe in 11 minutes (with intervals of cooling time in between, if you do not want to count on the cooling time, the total cooking time in the microwave oven is just 7 minutes in total!) will help you to make easy, quick, soft and delicious baked microwave potatoes which you can enjoy for breakfast, dinner, lunch or a quick snack. Once you have made this microwave potato, you can add it to any other recipes that call for baked potatoes as well. 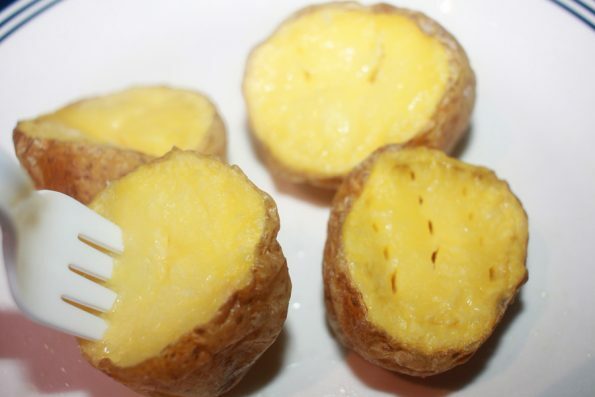 The potatoes cooked using this microwave potato recipe is really soft you can see how the fork can easily pierce through the soft potato halves. 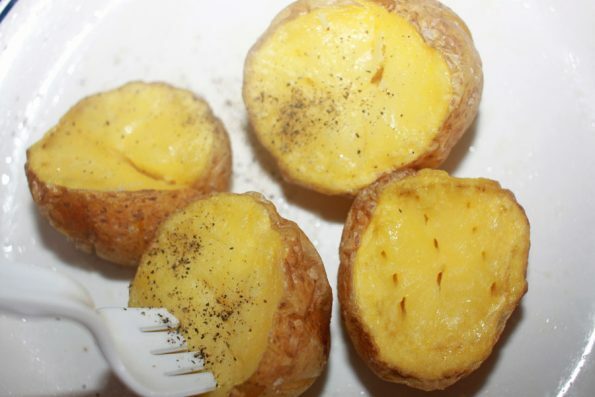 You can enjoy it as it is as the potatoes are so delicious and I just love to enjoy them with a little salt and sprinkled black pepper powder which makes a very yummy and quick, easy to make breakfast. 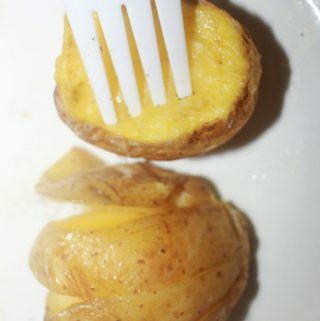 You may also add toppings like shredded cheese or you can add more flavors by adding spices like oregano powder, black pepper powder, red chili flakes (if you like it spicy) or add a spoon of butter which will just get melt in the hot baked potatoes. So the choices for flavors and toppings are many, if you have baked potatoes. And when you can quickly prepare them in the microwave in few minutes of time, its even better! 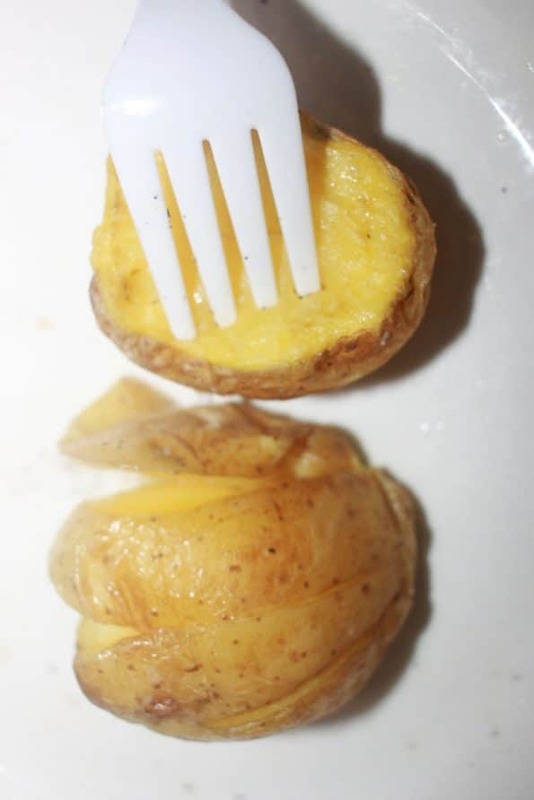 So here is how you can quickly and easily make baked potatoes in microwave following this easy microwave potato recipe. For this microwave potato recipe, I used regular yellow potatoes. Easy, soft and delicious yellow potatoes cooked in microwave quickly in few minutes. Cut the potatoes in half and cut through the skin of the potatoes to make a few cuts across the potatoes (you have to pierce the potatoes through the skin a little, but not too deep). Add the oil, garlic powder and salt and mix in with the sliced potatoes. Arrange the seasoned potatoes in a good quality microwave safe plate (do not use plastic plates or paper plates, I recommend using good quality microwaveable ceramic plates). Microwave in high for 3 minutes. Give a couple of minutes of cooling time, then flip the potatoes and microwave in high for another 3 more minutes. After giving a cool off time again for a couple of minutes, microwave for another 1 more minute so the potatoes will turn soft and delicious with the perfect texture. Allow the cooked potatoes to cool down as the potatoes will be really hot at this point, top with black pepper powder (or any of your favorite seasonings), serve warm! Based on the size and type of potatoes that you use and also based on your microwave oven, the cooking times may slightly change. I have used tow medium sized regular yellow potatoes which cooked perfectly in 11 minutes of total time, which includes few minutes of cooling time in between. As I mentioned, since this can vary based on the type and size of potatoes and also your microwave oven, always check how the potatoes are doing after cooking for about 2 to 3 minutes and give enough cool off periods in between as needed, until the potatoes are cooked completely. The cool off periods will help the plates from getting too hot and will also give you an idea on how much more time you need to cook the potatoes in the microwave. Hope you found this post on easy microwave potato recipe helpful in making easy, quick and delicious potatoes for snack or breakfast!